I left the Kung Fu retreat 2 weeks early than I planned. After much contemplation I did this so I could take a temporary teaching position in Si Racha. The job was contracted for 1 month, teaching homeroom to grade 1. 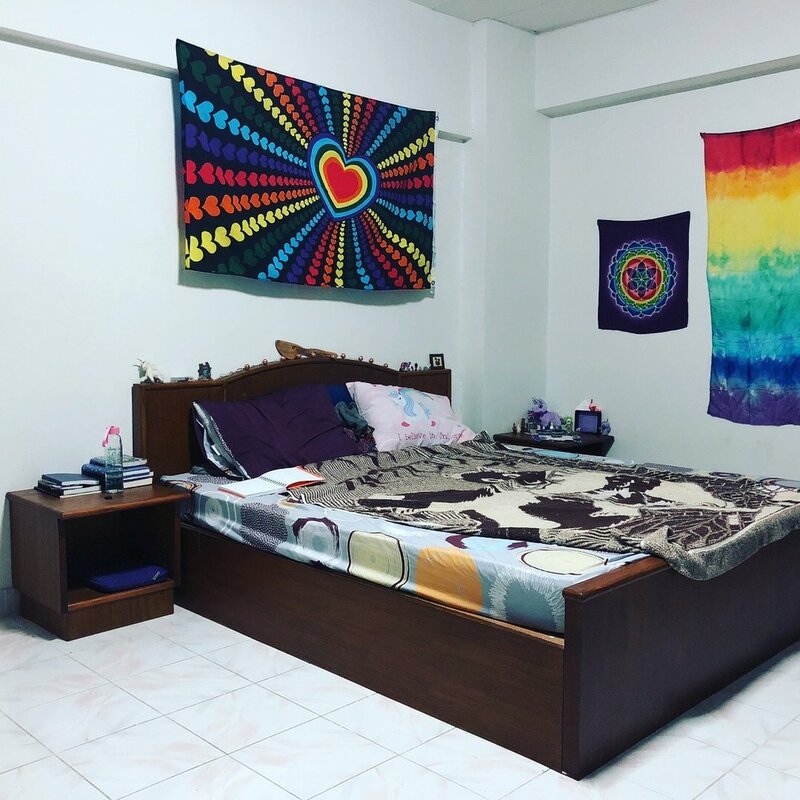 The benefits were earning $1000 USD, completing my TEFL practicum of 20 teaching hours of EFL, and the experience of working at a classical Thai international school. I will return to finish my Kung Fu studies in the early months of next year. I felt saturated with the amount of material I was exposed to and the learning I did while there. I felt it was time to move on, keep practicing on my own to integrate what I had learned, and begin to explore the many places of Thailand and find a secure teaching job for late October. 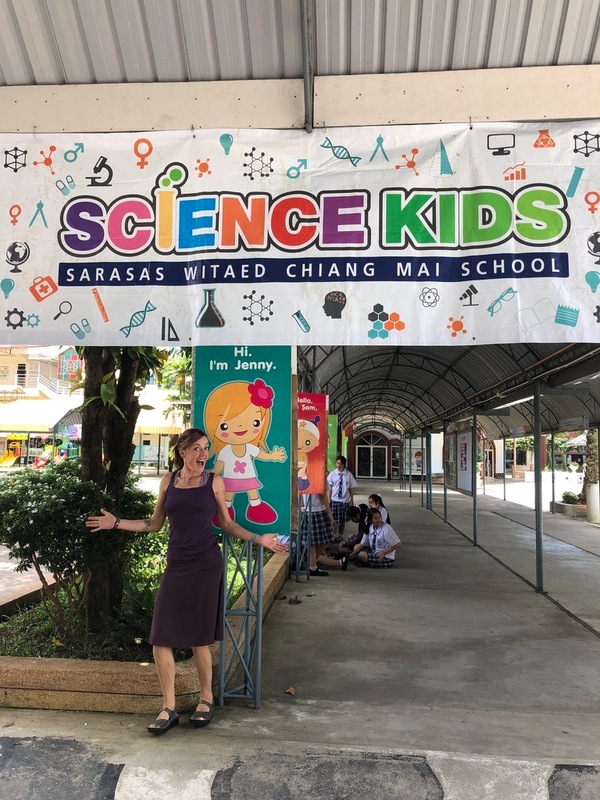 On my way down south, I stopped in Chiang Mai in search for a teaching position.. I stayed in a hostel/hotel called Sara’s Place and learned about the Thai version of Uber called Grab. I visited a night market and had the most wonderful BBQ chicken on a bamboo skewer - the best part was probably the sauce. I also got basket of fries to accompany my meat. There were too many fries and not enough company, luckily a handsome Australian was wandering around also sourcing food. I greeted him and invited him to join me. His girlfriend Jenny was sick in the hospital and he marveled that after 3 years of being together, this was the first time she ever eluded to being a person who actually ‘poops’. Lol! Andy and I walked around the night market briefly and it was nice to have some company. We parted ways and I returned to my room to rest up for the next day’s journey. Th next day I interviewed at a catholic International School called Sarassas Witead. There I met Sean, a helpful person from Facebook who told me about the opportunity and gave me a tour of the school. I was pleased to accept the English teaching position of grades 3 and 4. This took most of the day and when I returned back to Sara’s place, I was ready for some good food and cold Thai coconut. I mistook my train ticket and by the time I arrived at the station, the last train had left moments before. A friendly taxi driver told me he could get me to the next station in time for only 2,000 baht ($60!). I thought about this, configured in my head what it would cost to find another hotel in BKK, plus food, plus taxi, plus another train ticket, not to mention all the hassle and potentially missing my scheduled appointments the next day! My answer was Yes and off we went. We sped down the street next to the train tracks for the next 2.5 hours. He told me about being the leader of the red shirts back in the 80s, when there was fights between the kings men (in yellow) and the people of the prime minister (in red). We passed an Elephant Hospital, the only one in Thailand, and he told me about his 3 wives and 4 children. We arrived at the train station just in time and together we rushed to the train, him throwing my bags on board and me digging deep into my bags to find my stash of money (since the fare was more than I normally carry on me in an accessible place), throwing him large bills out the window. Success, I landed on a sleeper train to Bangkok. It was 9pm, scheduled to arrive around 8am. I didn’t sleep well due to the bright lights not turning off during the night, I was in an upper bunk and listened to Eat, Pray, Love while traveling. The next morning I headed down to Bangkok (BKK) for two other interviews; one at a language school, and another at a performance art school. Both of the interviews went well, however I decided I did not want to live in BKK. It was a very productive and busy day in the city! I saw the Queen’s Park and did some Shuan Yang there. I used Grab to get all around the city which was very helpful and stress free. At night I returned to my shoebox room after having “My Friend Pad Thai” and sitting with a German family. We chatted about school life, their favorite islands and eyelash extensions. I finally found a long sleeve shirt and was ready to teach! I was picked up by the agency the next morning at my hotel and driven about 2 hours south to Si Racha, a port town in the Chon Buri province. They put me up in a nice air-conditioned studio apartment equipped with a wood vanity and closet, a fridge, my own wifi router, a nice bathroom and a balcony that contained a kitchen sink. A wifi password was slipped under the door, I was instructed to get an App called Line, and that Clare would knock on my door at some point. I didn’t know when I would get instruction as to what I was expected to do the following day, so I took a nap and set up my new home. That night I was invited out to dinner with the teacher crew and I met my now good friend Jessie! There was a solo singer with a piano at a beautiful unoccupied outdoor pizza place, and it was here that we dined and sang together. The next morning I got my schedule or as they say my ‘time table’ - this schedule consisted of a few classes each day, with the majority of teaching being on Tuesday and Wednesday. I brought my ukulele and prepared “sing a rainbow” for them, along with a story about a unicorn who thought he was a narwhale. When it was my turn to teach, I walked into a classroom full of rowdy kids playing…. No teacher, no hand off, no welcome, no rules, no instruction, just a time table and a group of 1st graders in a contained air conditioned classroom. Wow… what a circus. I won’t go into all the detail it took for me to even get their attention much less lead them in some kind of enriching learning experience. This class was loud and I didn’t know how to get them to even hear me. I ended up having to walk around the room and tell each child “sit down” while touching their shoulder. By the time I circulated the class, some of the kids I instructed earlier had now gotten up - it was like putting worms in a can or kittens in a box or slinkys into a lunch box - you could do it, but it wouldn’t stay there long. It only took me a week and a day before I was completely frustrated and needed to call a friend to say “I DONT WANT TO BE DOING THIS!” Good thing I figured that out early! I did conquer them eventually, what I had to do was give them a silent count of 5 to calm down and do what they know to do (sit at their desk and listen to teacher), if they didn’t do this by the end of 5, they got 1 strike on the board. If they got 3 strikes, they had to put their heads on the desk for 3 minutes. If anyone got up or made sound during this time, then they would be given another minute of desk time. We did this ALL DAY LONG until by the end of the day, they were telling each other to sit down and be quiet. The longest they had to lay there was 7 minutes. I finally controlled the class without using or hurting my voice. We did dance Tue Tue together and sang “Sing a Rainbow” joyfully. Who I spoke with my wise Grandmother about this (and all things) she reminded me to ask myslef, What Am I Learning? And so I took this into contemplation and came out this this: I don’t want to “teach” grade 1 (a form of musical babysitting which I wanted to advance from) and I don’t want to work in a city. I want my time in Thailand to be a beautiful adventure, not another form of trying to make ends meet but this time in a foreign land with naughtier children and less music! I also did the math for the average teacher pay (around 30,000 baht a month) come out to just under $1000, which is $250 a week or $50 bucks a day! I do not want to do this kind of ‘teaching babysitting’ for $50 bucks a day! These are good things to learn. I got my $1000 bucks, practicum hours logged to finish the TEFL course, a lovely apartment, a new friend and experience to base my next decisions from. And so it is a good thing I kept up my job search! I found another teaching position in Hua Hin at a DaVinci International school which values various learning styles and the “whole brain” child - a place where music, nature and kinesthetics are valued! I was offered a position teaching English to K-4 (okay I can compromise) along with music in an after school program (not included in salary they said, so I guess that means extra time = extra money? I hope so…). Hua Hin is a beautiful area on the top right side of the left tail of Thailand, very near the Myanmar border (perhaps a good visa run?). The school is beautiful, the street is green, the classrooms are bright and colorful. The position pays 35,000 and includes a accommodation. So overall, it is a better teaching position and living location. I accepted the job and will begin October 22nd. Meanwhile, I’ve been engaging in the online teaching application process which includes several parts; 1) have a brief skype interview with someone from the agency 2) create a live video using their slides, or do a mini mock class live with an adult acting as a 7 year old and grading you at the same time 3) if that goes well you get sent to training, either a 2 hour class, or a series of videos to watch and questions to answer after (also 2 hours) 4) another mock class either with a different adult acting as a 6 year old, or a live class with real students! I did this process with 3 agencies, DadaABC (panda themed from China), VIPkids (animal themed from China) and SayABC (kid themed from China). Each had their own material and separate platform apps. Of all of them I like SayABC the best. I decided to not continue with VIPkids because I found their training, feedback and super rigid expectations to be frustrating. I was offered a position with DadaABC first and was recently offered a position with SayABC! YEAH! What else am I learning? I want to see more of Thailand and so I booked a week in Krabi on a island called Ko Lanta where I can see mangroves, monkeys, rent a scooter and go snorkeling! I really want to be in the tropic nature and see the wildlife here. I want to experience the warm and clear ocean water, I want fresh air and friendly people. I’ve made a great friend, Jessie, and her and I have been laughing, sharing and spending lots of time together. We went to Bang Saen beach one weekend, Pattaya beach the next and Kosichang an island off Si Racha this last weekend! We found monkey and unicorn friends that we take everywhere and I’ve been teaching her Kung Fu - doing this has been so enjoyable for me and reminds me how much I love to do physical instruction for well being! She has always showed me how funny I am and I am considering writing down some of my bits to try out at stand-up comedy if the opportunity ever presented itself. And so here I am, first night in Ko Lanta, finishing up my blog of my recent adventure in Si Racha, where the food is salty, there is nowhere to walk on the road, and the air is thick with what does not feel like oxygen. I took a mini bus from Si Racha to BKK (120 baht) then a taxi to the airport (50+70+180 baht) then a plane ($70round trip) to a bus (80 baht) to a minivan (350baht) whew! larger transportation expenses than expected! PS. Walking on the streets of Thailand is like a mini obstacle course, be it the path ends, or there are random giant stone protrusions, loose telephone cables hanging above your head, a sudden rope tie to some distant tarp, a lazy dog hopefully friendly or tired, a scooter or TukTuk veering upon your tiny 2 foot space. There is no straight path here and thats okay with me. PPS. Thai massage is the best! They start at the feet and spend quite a lot of time on the legs, finally the back gets an allotment of about 15 minutes of attention over hour. The foot massage however is the best hour ever spent! Full foot, ankle and leg treatment… it’s a slice of heaven!